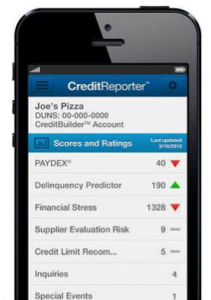 The Dun & Bradstreet Credibility Corporation has introduced a mobile APP, “CreditReporter,” to provide business owners quick and easy access to credit information they need most. The APP uses the latest technology and is lightning fast. Among other features, users can see their companies’ profiles and credit scores in real-time, can find out when others are pulling their report, and can receive instant alerts when scores change. They can also add business credit references and see the status of those references. In addition if one needs help, users can tap to call Dun & Bradstreet Credibility Corp. to speak to a credit advisor within minutes. Jeff Stibel, CEO of the Dun & Bradstreet Credibility Corporation bought the company from D&B in 2010 for US$100 million. The company concentrates on aspects of financial and information literacy for small businesses. Stibel uses Abraham Lincoln, the world’s most renowned credit reporter as a metaphor for introducing his mobile APP called the ‘CreditReporter’.